I bought some great Christmas ornaments at Michaels a few weeks ago. I was actually looking for plastic ornaments (I do have a toddler) and thought that's what I bought....until I sat down to craft with them! I'm probably going to bring most of them back but I did really like the four pack of round, kind of flat ornaments I had and decided I'd make something...we'll just have to hang them up higher on the tree! I really like how painting the front and back of the ornament gives it some dimension. It's almost like you're looking across a snowy field to some trees in the distance. 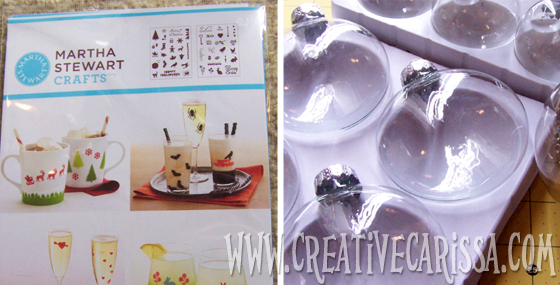 Obviously not all the supplies are pictured, but this is what the stencil pack and the kind of ornaments I used look like (in case you need them for reference when you go shopping to make your own awesome ornament!). All these supplies are available at Michael's. 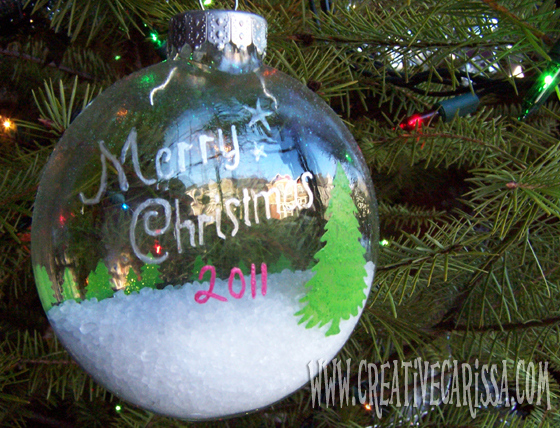 I cleaned the ornament so there was no grime that would keep the stencil or paint from sticking. 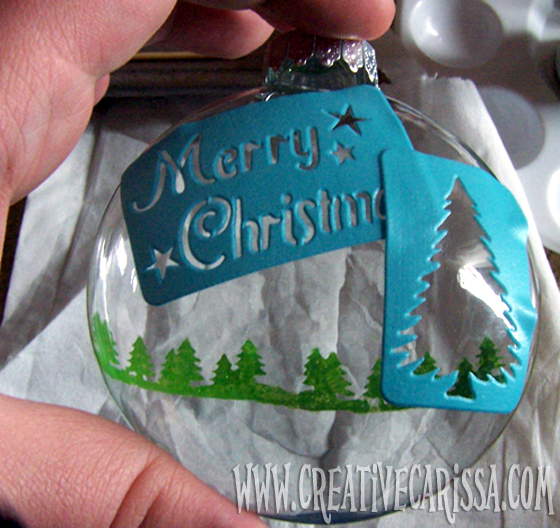 I took the tree line stencil of the sheet and stuck it on the back of the ornament. The baseline of the trees was about 1/3 of the way up from the bottom. The self adhesive qualities of these stencils are great. They stuck to the curved surface really nicely and kept the paint from seeping under. 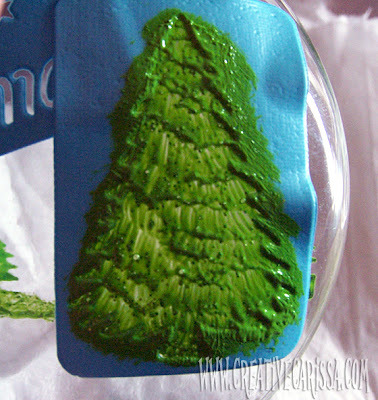 I painted the trees with a green satin paint and then painted over it with the green glitter paint while it was still wet. 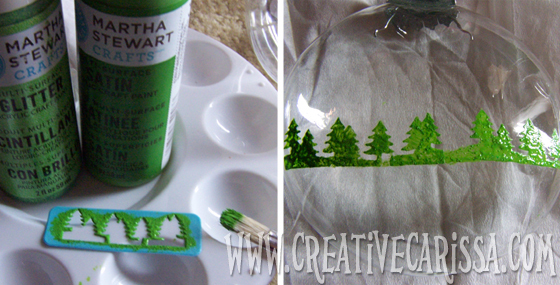 Then I peeled up the stencil and moved it over to do a second set of trees. Normal people would have waited for the back to dry first but I'm impatient. So I just carefully held the ornament at the top and bottom so I would not smudge the paint on the back (that tissue you see is actually on the floor...it's not touching the ornament). 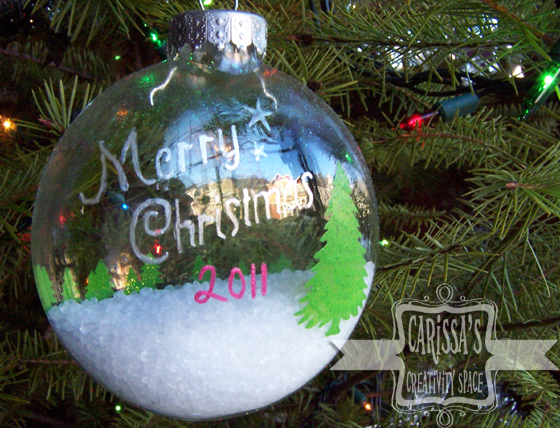 I took the large tree and the "Merry Christmas" stencils from the same pack and placed them on the front. 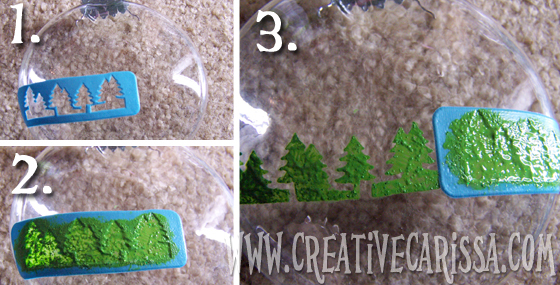 The tree line you see in the picture above are trees that are actually painted on the other side of the ornament...I didn't place the big tree on top of them. I used the same satin green and glitter paint from the previous step. Painting on glass requires a little extra paint than on fabric so I made sure to use my visible brush strokes to my advantage by kind of feathering them out in layers to make it it look like layers of branches on the tree. 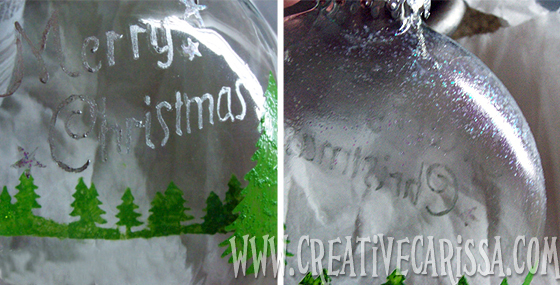 I peeled away the tree stencil and painted the Merry Christmas with metallic silver. Once I removed the stencil, I filled in some of the gaps with a fine paint brush. 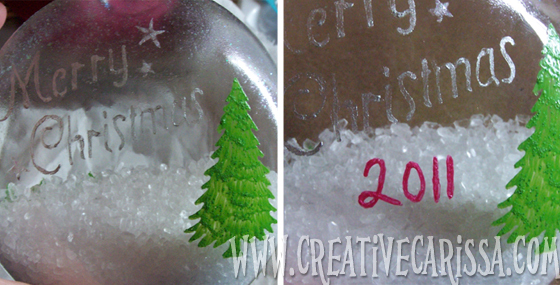 Once that stencil had been peeled off, I painted a really thin coat of glitter paint to simulate snow (it's the "Sugar Cube" paint from Martha's glitter paint line) on the shoulders and across the back of the ornament. And by thin, I mean really thin. 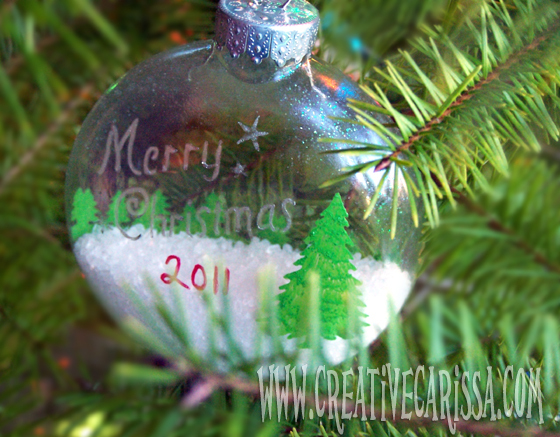 I dipped into the paint, wiped it off on a paper towel and blotted any glitter that remained onto the ornament. So kind of like dry brushing. But with glitter paint. 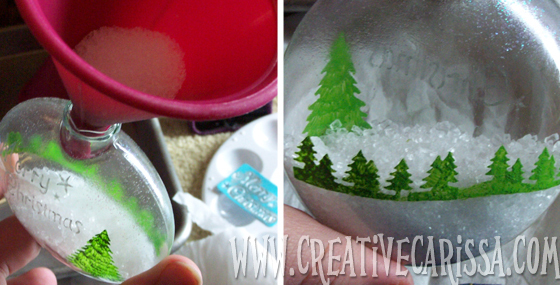 I really carefully removed the top and used a funnel to fill the ornament with epsom salt up to the level of the tree line along the back. Once the salt was in, I decided the front looked a little bit too plain, so I added the date free hand using a thin detail brush and red pearl paint. And while it probably would have been fine, I was a little nervous about how much more the ornament weighed now that it was 1/3 full of salt so I used glass and metal glue to glue the cap down once I reinserted the top/pin. I really love receiving hand decorated ornaments as Christmas presents. 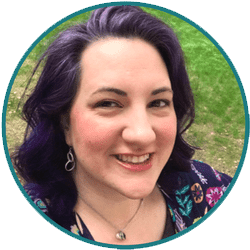 I'm not sure how well I could create my own, but they are cherished keepsakes for me to receive.